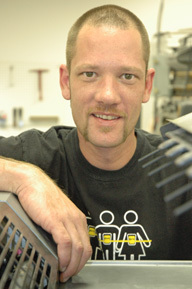 Jason, a Dallas native, started his career in printing with us in 2000. Prior to that he was a carpenter for new homes. Working outside in the hot summers was not his cup of tea. Working indoors with A/C is more to his liking. Jason's interests include fishing and hunting. His favorite movie is Scarface. He enjoys "Old Country" music and El Chico restaurants.